you have a mind of your own. 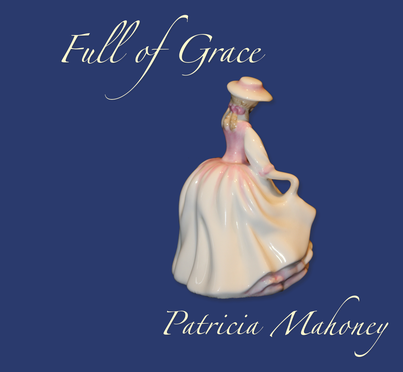 Full of Grace is a collection of stories set in the 1950s and 60s about a young Canadian girl, Mary Margaret, and her journey from inquisitive child to young woman - with a stopover in gawky adolescence. The book comes with a CD of Patricia reading the stories with musical punctuation by guitarist, Jamie Moore. www.jamie-moore.com. 'It's prose but also quite poetic in its elegant images and flow of the pen. Read by Patricia Mahoney with musical punctuation by Jamie Moore. Full of Grace was launched at the Tom Thumb Theatre in Margate on 15 April 2016. The theatre sold out a week before the event. The book sold well and the presentation was so well received that it was decided to do more of the same. The Mosaic Cat and Beachkeys produced a further reading / performance of Full of Grace at Conquest House, Canterbury in May and Conquest House programmed it again in October as part of their Umbrella programme during the Canterbury Festival. Patricia and Jamie were subsequently asked to perform excerpts from Full of Grace for a number of local community groups and organisations. In November, Patricia and Jamie did a lunchtime reading at The Jermyn Street Theatre in London's West End. The reading was well received and as a result they have been invited to participate in a number of festivals including POW! Thanet celebrating International Women's Day and the Whitstable Literary Festival. For more information about events, please go to the Events page. Please contact Beachkeys if you would like to stock Full of Grace in your shop.